Texture is compatible with most phones which run Android 4.1 and up. Texture is also compatible with Android tablets (see the Android Tablet User Guide). The User Guide provides you a hands-on tour of top features in the Texture app. · One consistent experience: All titles in your personalized library are read through one easy-to-use app, with a common navigation method and consistent user interface throughout, so you can focus on the content and not how to use the app. · Favorites and Categories: Organize the magazine titles you enjoy most, either as favorites or in categories such as Health & Fitness. 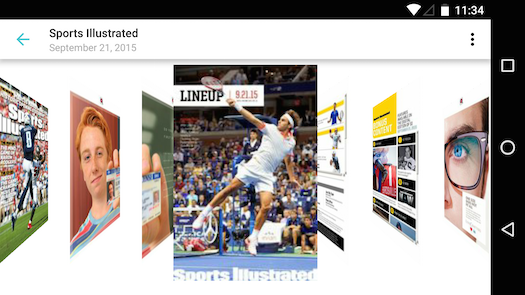 · Background download: Tap on the download cloud icon of any magazine issue to save it, i.e. keep it locally stored on your Android device. · Carousel: The beautiful carousel experience allows you to visually see all the content available in the magazine and rapidly navigate through it. · Storage management: Manage how much storage space the Texture app can access by tapping on "Storage" in the settings menu. · Enhancements: Get all the great interactive features of your favorite magazines including video, audio, slideshows, tap-to-reveal active elements, in-article scrolling, quizzes, and embedded web content. 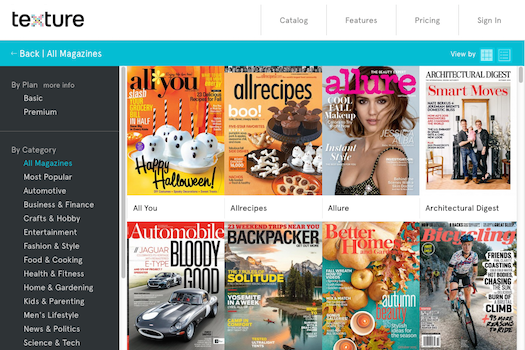 For the first time ever, Texture allows customers to read any magazine they want for one low monthly price. 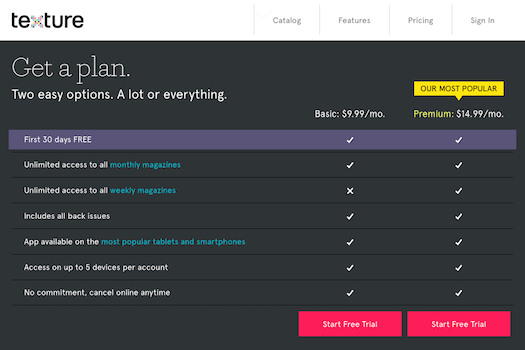 No more keeping track of multiple subscriptions with different prices. · The Unlimited Premium plan ($14.99 per month) provides access to every magazine in the Texture catalog including weekly titles (such as Entertainment Weekly, People, Sports Illustrated, The New Yorker, and TIME). · There is a free trial offered with our Unlimited access plans. After the free trial, you are charged monthly. NOTE: Download the app and tap the start free trial option. All account transactions take place in the browser. For customers who discover the app in the Google Play Store, after they install and open the app for the first time, they'll be directed to texture.com in the browser to create their account and purchase after tapping the start free trial button. 1. 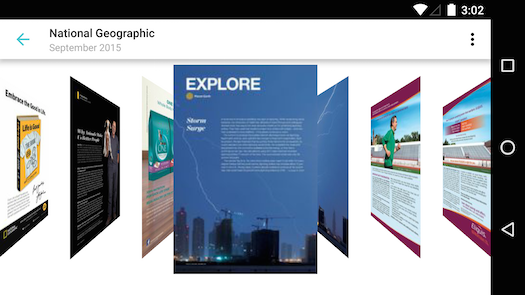 Download the Texture app from the Google Play Store. Once downloaded, open the Texture app and tap the "Start Free Trial" button to be redirected to our website www.texture.com. 2. Tap "Catalog" at the top of the screen to see all of the titles Texture offers. 3. Tap or click "Start Free Trial” to sign up. 4. 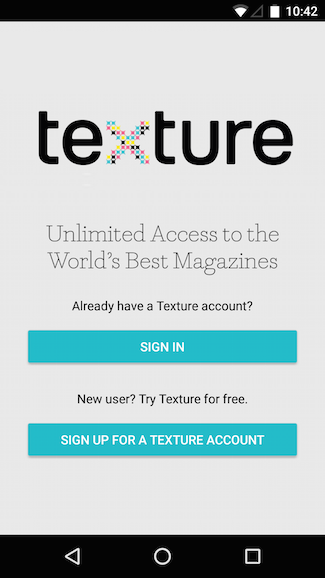 After you have signed up for a subscription, you will be prompted to download the Texture app. If you have already downloaded the app, you can now close your Web browser and open the app. 1. When you open the app, tap "Sign In" and log in with your Texture account. 2. A single personal library: Open the app and see your complete library. No more islands of apps for each title with different navigation and look and feel. 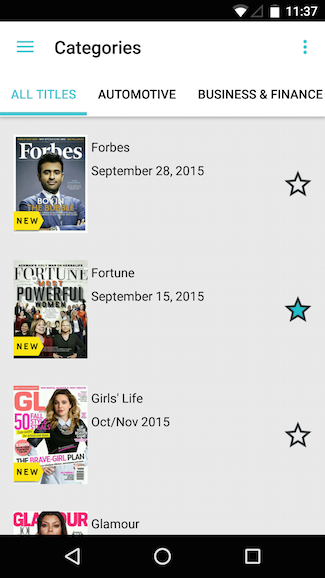 Now you can browse, manage and read all your favorite magazines in one place. 3. Categories: After you have signed up for an Unlimited plan and signed in to the Texture app, swipe in from the left edge of the screen or tap the menu icon, then tap "Categories". 4. 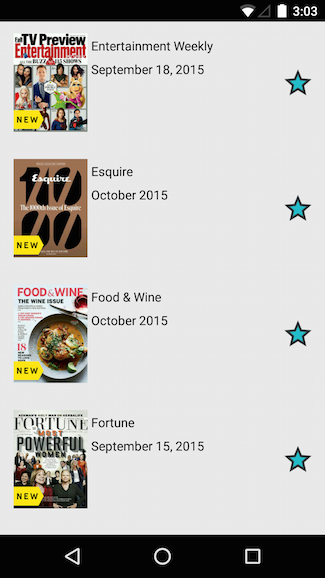 My Favorites: In the Categories page, you can quickly add a magazine to your Favorites by tapping the star icon in the lower-left corner. When the star turns from grey to blue, it's been added to My Favorites. 5. Your selections will now appear in the My Favorites library. 6. Tap on a title to see all issues of that magazine available for you to read. 7. Tap on any issue to open it. You do not have to wait for the magazine to fully download to start reading. 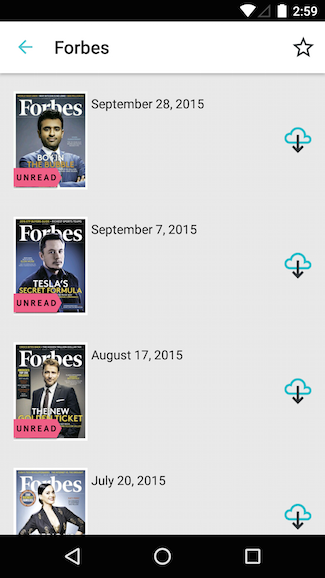 You can also tap the cloud icon to download an issue for later reading. 8. To delete a single issue that has been downloaded, tap the "x" ( ) beside that issue. 1. Index and carousel view: When you open a magazine, you will first see the issue’s index for an easy overview of all content. Rotate your phone to landscape mode to view the unique and beautiful carousel. No more getting lost when navigating. 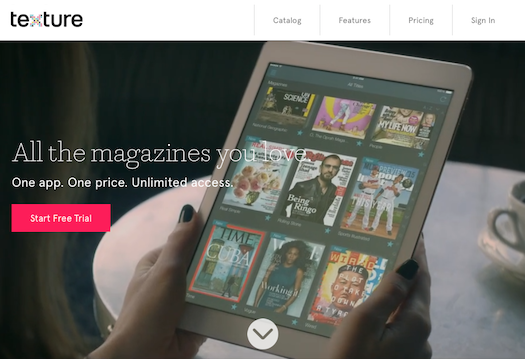 The carousel gives you a new way to rapidly navigate through a magazine. 2. Portrait and landscape view reading: Read individual pages in portrait or landscape mode as designed by the magazines' publishers. Easily swipe left or right, or scroll up and down to reveal more pages. Double-tap or pinch to zoom in to get a closer look. 3. Landscape view reading: Turn your Android phone to landscape to take full advantage of the wider screen. 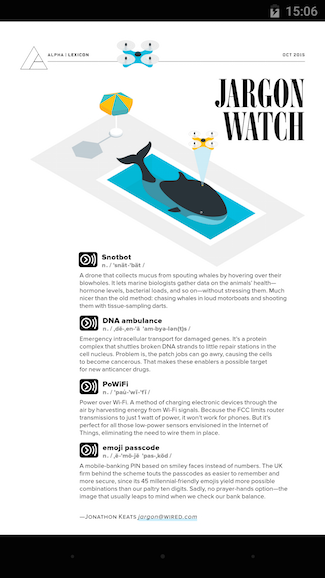 Enjoy the gorgeous one page reading mode, allowing you to read without the need to zoom. Simply scroll down to reveal more of the page. 4. Enhancements: Many magazines include enhancements. Tap on active elements throughout the magazine to jump to other pages inside the magazine, play videos, view slide shows and much more. 5. You can return to the library by tapping the screen to bring up the menu and pressing the back arrow in the top left corner. 1. 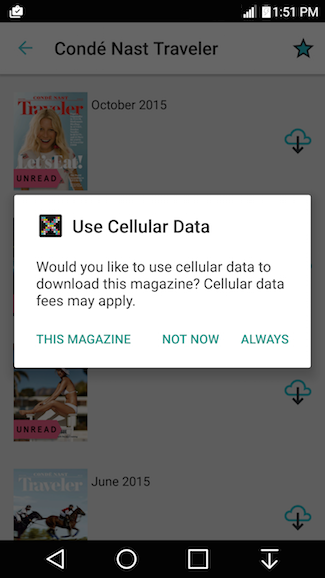 Cellular Settings: When opening a magazine on cellular connection for the first time, the app will confirm that you want to use cellular data to download the magazine. You can also tap on the Menu icon in the top left corner or slide from the left edge to reveal the slide-out menu, then tap Settings, then tap on Use Cellular Data to allow or disallow use of cellular data to download magazines. 2. Storage Management: Tap on "Settings" in the slide-out menu to access Storage Settings. This feature lets you manage how much space you want the app to take up on your tablet. You no longer have to worry about running out of tablet space because of large magazine files. Set your storage limit once and forget about it. There are five different settings representing 10, 25, 50, 75 and 100% of the storage space on your tablet. 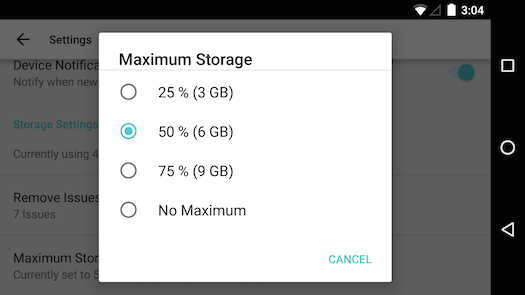 Users can select their preference under "Maximum Storage". Once you reach the storage limit you've set, the app will delete the earliest-read content first to make space for the new issues. Don't worry, all your magazines are stored in the cloud, and you can always re-download them again. - In Android Settings, go to "Application manager" (or "Apps") and tap "Texture"
Now the app and all stored magazines will exist on your device’s SD card memory and not in the device’s main memory. - Tap anywhere on the page that doesn't have interactive elements (such as video, photo galleries and some ads) to view the top and bottom navigation bars. - Tap the Save ([+]) button in the top right corner of the screen. From there you can choose which Collection to save the pages in. You can also add a note to your saved story and/or create a new Collection. - Tap on the "Saved Stories" tab in your My Library view to browse these stories later. 5. In Settings you can also manage Notifications. Slide "on" if you want an email or a device notification each time a new issue of your favorite magazines is available. 6. If you are experiencing problems with the app or have questions, tap on the Menu icon in the top left corner or slide from the left edge to reveal the slide-out menu and tap "Help", then "Support & FAQ". Or simply open a web browser and visit https://texture.com/support/contact/. Thanks for taking the time to explore Texture. Now, with a single app and unlimited access plans, you can experience enhanced editions of the world's most popular magazines.